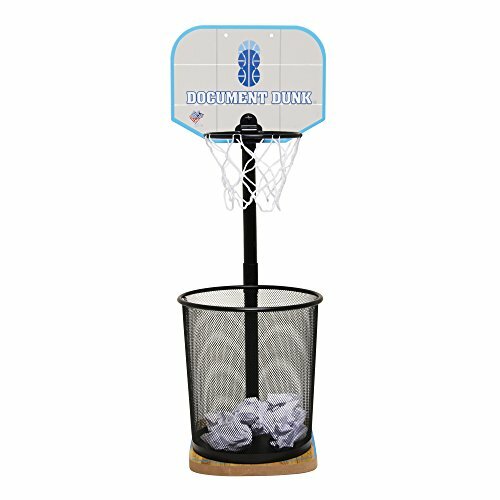 The Document Dunk is the original basketball trashcan hoop designed for those who compete in the corporate arena. The Document Dunk office basketball hoop is unlike any other indoor hoop / basketball hoop trashcan on the market - specifically created to withstand even the harshest of office conditions. The Document Dunk’s authentic basketball-court-inspired base and sleek design set the Document Dunk apart from other mini hoop / bedroom basketball hoops on the market. When used in an office environment, the Document Dunk can be used for countless office games for adults! In addition to looking great in the office, the Document Dunk is the perfect basketball decoration for any sports-themed room! The Document Dunk is the original basketball trashcan hoop designed for those who compete in the corporate arena. The Document Dunk office basketball hoop is unlike any other indoor hoop / basketball hoop trashcan on the market - specifically created to withstand even the harshest of office conditions. The Document Dunk’s authentic basketball-court-inspired base and sleek design set the Document Dunk apart from other mini hoop / bedroom basketball hoops on the market. When used in an office environment, the Document Dunk can be used for countless office games for adults! In addition to looking great in the office, the Document Dunk is the perfect basketball decoration for any sports-themed room! If you have any questions about this product by The Dunk Collection, contact us by completing and submitting the form below. If you are looking for a specif part number, please include it with your message.